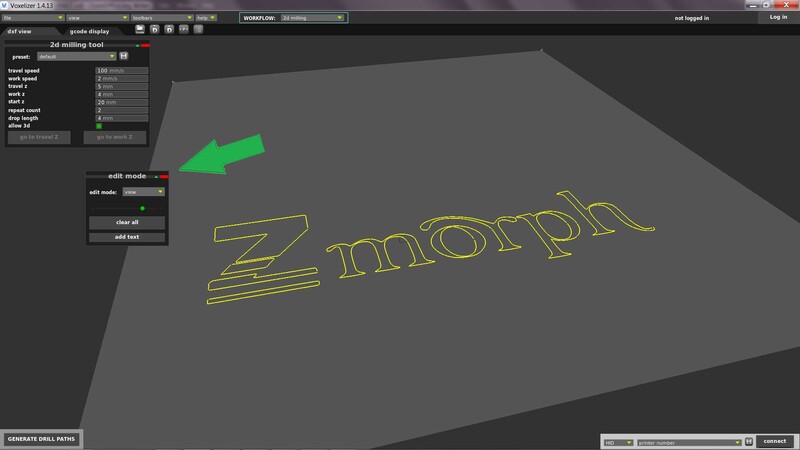 In this Voxelizer Software workflow you can arrange your .DXF files for 2D milling in various materials. When you open this workflow, you will find two menu windows here: 2d milling tool, edit mode and material dimensions (available since Voxelizer 1.4.16 version). 2D milling tool menu is for setting all the parameters of the drilling. 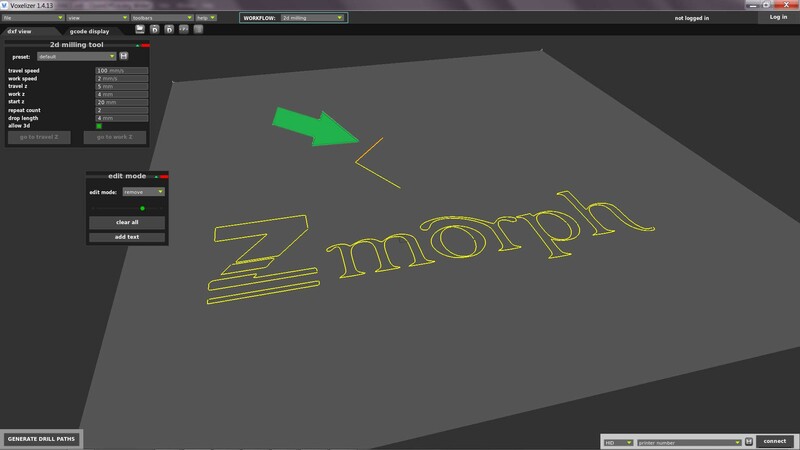 The Edit mode menu allows you to move, navigate, and rearrange the .DXF file. The material dimensions menu is used for setting dimensions and placement of material you will mill, visible as blue box placed on the table. 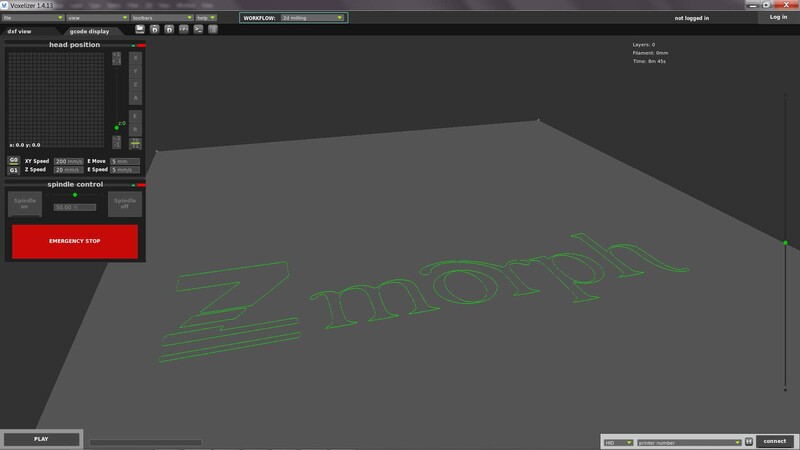 There is also graphic as a help to material settings. Preset - Here you can save your presets or choose the ones that you made before. This is useful especially when you have many files to manufacture with the same settings. Work speed - Speed depends on what type of material you mill. The general thumb rule is the thicker the layer milled at a time the slower the speed. Also the harder the material milled the slower the speed. We recommend making a trial and error run on a separate piece of material before moving to the proper one. Travel Z - Height to which the mill moves when going over an already milled part of the material. In general, it’s for navigating your .DXF files on the working bed. View - You can turn the view with your mouse. Move - This enables you to move your file around the table with a mouse. Add - Enables you to draw and add lines to your existing .DXF file. Remove - Delete and subtract lines from your existing .DXF file. Scale bar (green spot) - Adjusting this bar makes your .DXF bigger or smaller. Clear all - Deletes all imported files. 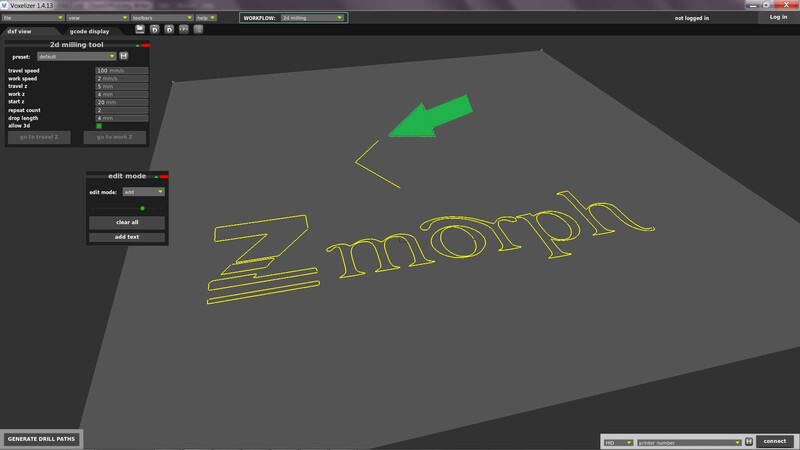 Add text - Allows you to type text which automatically becomes a .DXF file. Menu used for setting milling material dimensions and its placement on the worktable. Part of dxf file that is out of boundaries of shown blue box, will be discarded from milling. After you decided on all the milling settings and placed your .DXF file in a correct position, you can proceed with Generating Drill Paths. The only remaining thing to do now is saving the file on your SD card or pressing PLAY if you’re already connected to your printer.